If you think this country’s political culture is the quintessential hornet’s nest – awash in cutthroat competition, corrupt personal relationships, obsessive quests for money, rabid sexism and workplace dysfunction – you probably haven’t been exposed to life in the world of scientific research. Along with all the endless higher education, intellectual rigor, peer review, pressure to publish, sheer tenaciousness and deeply original thinking so essential to the work done at the labs and universities where science is of the essence, there also is a whole lot of unsavory politics. 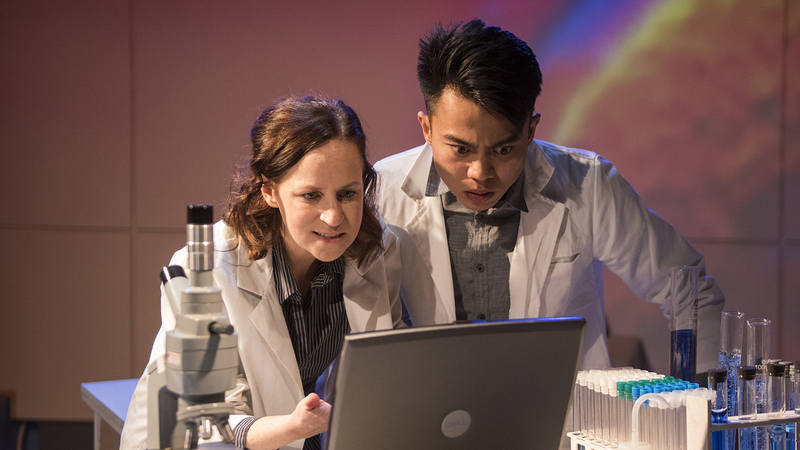 And in her play, “Scientific Method,” now receiving a crackling world premiere at Rivendell Theatre, Jenny Connell Davis puts it all under a powerful magnifying microscope. Davis has set her play at Garfield, a major (fictional) research university where the proverbial “cure for cancer” is being pursued by several different groups, each of which is led by a P.I. (principal investigator), who oversees the work of a group of top-notch postdocs. In this case, the P.I. is “senior scientist” Julian Millard (an ideally smarmy Josh Odor), a renowned hotshot and notable narcissist who has mastered the all-important art of securing funding and favor. Millard frequently spends his group’s money on extensive travel to conferences while denying this opportunity to his younger associates who might benefit from similar exposure, and who are in need of upgraded equipment. Millard’s gifted but reserved postdoc and teaching assistant, Amy Lee (the wonderful Ashley Neal, who perfectly captures her character’s mix of brainy intensity and lack of political savvy) has been working her tail off for him for six years, and she is about to publish a career-making paper with important insights into the way proteins affect cancer cells. At the very same time, Millard has invited Danilo (“Danny”) Bayani (a shrewdly charming performance by Glenn Obrero), a smart and sassy neophyte and hotshot-in-the-making, to join the group (the two men bonded on the basketball court). When Millard, who has been sitting on Lee’s paper for an unnecessary amount of time, returns from a conference in Hawaii he informs her that she has been scooped by another scientist from a university in California. That scientist just happens to be his friend – a man in a quest for tenure. Not surprisingly, Lee, who sees her career, and her own chances for additional grants and tenure as having been quashed, is devastated. Millard brands her as hysterical. But when she learns the extent to which she has been horribly betrayed she finally gears up the courage to ask for help from Marie Healy (a whiplash-sharp turn by Carmen Roman), the only woman at the lab in a top position. As it happens, Healy is a politically shrewd survivor and hell-bent on being named to an endowed chair. Adding to the tension (in a plot line that seems just a bit forced), is the arrival of Makayla Lozada (the wholly charismatic Courtney Williams in a notable Chicago debut). A first-year university student, and one of the very few African-Americans pursuing science at the school, she is initially full of self-doubt and wants to drop out of her challenging chemistry class for fear that a poor grade will result in the loss of her scholarship. But Lee, sensing her potential, convinces her to stick with it. Devon de Mayo’s razor-sharp direction, and Lauren Nichols’ lab-on-wheels set, are stunningly enhanced by Anthony Churchill’s grand-scale color projections showing the molecular mechanism of protein-folding in cells. And, as someone with a number of friends deeply engaged in this world, I can attest to the fact that Davis has ideally captured the elite subculture of high-stakes science and injected it with just enough substance and skullduggery to make it real. If there is any consolation in it all it is that the truth invariably wins out in science. The truth in human beings is quite another matter. “Scientific Method” runs through Dec. 2 at Rivendell Theatre, 5779 N. Ridge Ave. For tickets ($38) call (773) 334-7728 or visit www.RivendellTheatre.org. Running time is 90 minutes with no intermission.